Vote for the hunter who should be named Extreme Huntress at extremehuntress.com/vote. The top four will travel to Hondo, Texas, in July, and the competition will be aired on a future episode of “Eye of the Hunter” on the NBC Sports network. Amanda Lowrey pulls the string of her hunting bow back and aims at a 2-foot target behind her Sandpoint home. With a sharp twang, she releases the arrow. 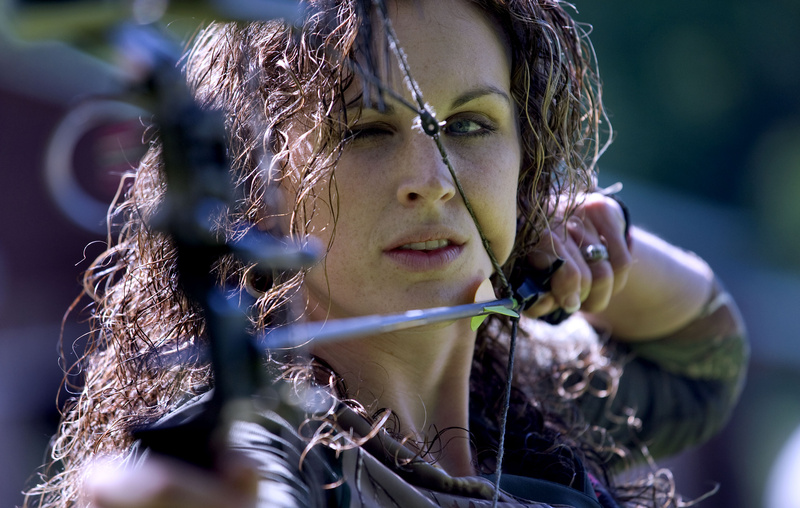 Her aim is true; the arrow lands just centimeters from the center of the target. Lowrey, 24, is a mother, a wife and an avid hunter. The camouflage of her shirt is interrupted by bright pink snaps. A pair of sparkling silver antlers hangs from her necklace. Her manicured hands clutch the PSE Baby G hunting bow, which shoots arrows at 280 feet per second. Now, Lowrey is facing nine other women across the country for the title of Extreme Huntress, a competition that pits female hunters against each other for a spot on national television. The contest is intended to encourage more women to hunt and continue the tradition of hunting through generations. Hunting “is such a rewarding experience, and it’s something that I’m passionate about and that I love,” she said. Lowrey’s passion for hunting began when she was 5 years old; she’d spend hours with her father, Kevin Reynolds, hunting near Sandpoint. Lowrey shot her first deer at 13, her father said, a white-tailed buck she spotted behind their home. She cleaned the deer and brought it home by herself. Lowrey and her husband, Tyler, are instilling the same love of the hunt in their own children. Maya, 4, and Joanna, 3, have been out hunting with their parents since they were barely old enough to walk. Lowrey said the two girls will get their licenses as soon as they turn 12. “It drives my oldest nuts that she isn’t old enough to hunt yet,” Lowrey said. In Maya’s case, she was hunting with mom before she was born. Just two weeks before she gave birth to her oldest child, Lowrey insisted on going hunting with Tyler, who had recently had leg surgery. When a black bear trundled out of the woods, Lowrey fired, killing her first bear. The animal rolled 500 yards down a steep hill, and she and her husband had to drag it back to camp. Lowrey needs help to achieve the title of Extreme Huntress. The top four candidates will travel to Hondo, Texas, July 11-14. The competition will be shown on a future episode of “Eye of the Hunter” on the NBC Sports network. Lowrey is currently in fourth place, but the results are close. To vote, visit extremehuntress.com/vote. Regardless of the outcome, Lowrey’s love of nature and the thrill of the hunt will keep her behind the sight of a bow and arrow.